The Rock Crystals show razor sharp termination, all faces show exceptional; mirror-like luster and on highest level even for alpine standards. 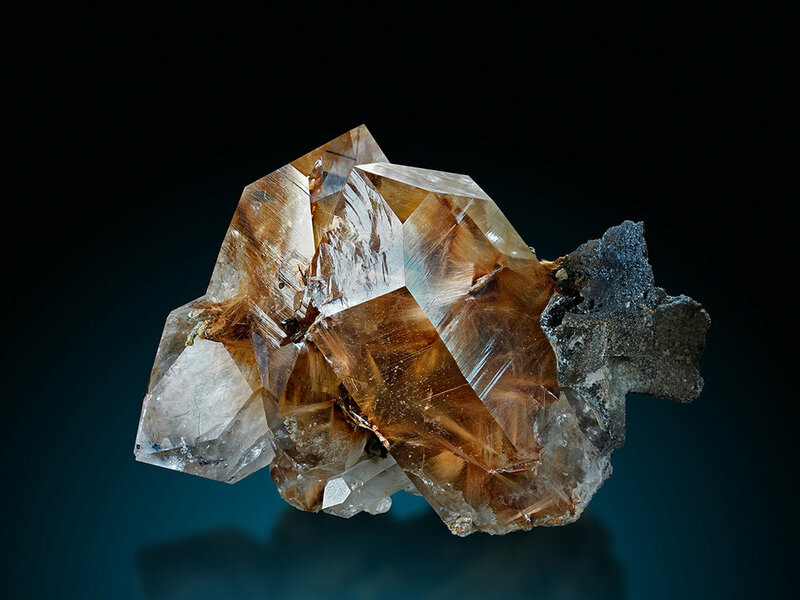 Rutile inclusions are not too uncommon - from Alps very rare, but well known from Brazil. So the special feature of this material is the further combination with Brookite. Some Brookite are inter grown to the faces where the two main crystals collide. And when you look at the right hand side you can see a fish-tail like assemble - these are two huge Brookite crystals, covered with Chlorite. And this combination - two Titan-minerals on and inside Quartz - is unique. I do not know - and I did a lot of research - any other locality that produced this amazing and eye-catching combination. The material was found about 3 years ago - and in opposite to many other discoveries - it didn’t come more. Think of Brucite or Fadenquartz or common Brookite specimen: first an sensation, then hundreds and thousands of specimen flooded the market. But this combinations came only from one cleft and never came twice. So this pieces are really of high relevance. I saw most good pieces of the discovery and this was in my evaluation the best. Most others had more grey-yellow Rutile, the included sprays of Rutile inside these crystals are intense red and the second special indicator is the aesthetic assemble and the high quality of Rock Crystals. No significant damages to report and very showy in various positions.